Fall conference season starts for me next week with Office 2.0 in San Francisco. With one post conference organizer Ismael Ghalimi started a blog avalanche and Dennis Howlett, Zoli Erdos, Vinnie Mirchandani and Susan Scrupski provide a long list of reasons why you shouldn’t miss this event. However there is one more reason to attend. I will do the first public presentation of Genesis (code-name of the product I have been working on for the last 9 months) and talk about the motivation for the project, the upcoming pilot and our roadmap. I truly believe Genesis has the potential to change the desktop of business users in the enterprise fundamentally. Think about it as an iTunes for Business or a personal portal local to your desktop with integrated collaboration features. But don’t take my word for it and come to Office 2.0 to judge for yourself. SAP TechEd is only two weeks away and I am proud that Adobe once again is the main sponsor of the RIA Hacker Night this year. Last year Mark Finnern and I were sitting in the courtyard of SAP Labs in Palo Alto and discussed ideas for new TechEd activities Adobe could sponsor. We thought why not rent a hotel suite in Vegas, order some pizza and do some serious hacking. Well it turned out a suite would have been to small and Craig Cmehil took the lead in setting up a great event. This year Hacker Night will be even bigger and better. So I thought we need T-Shirts and a mascot. Since we did not have budget left for a Designer I was lucky enough to get introduced by Karen to Eric Kneeland who created the graphic for the T-Shirt based on Karen and my ideas in return for a copy of Illustrator. 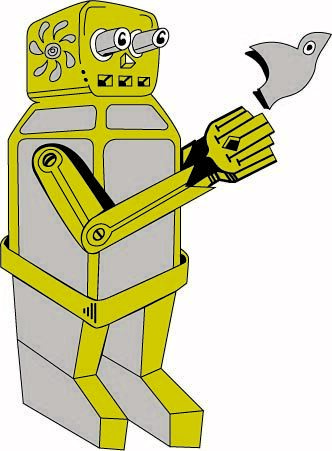 So without further due below is the official RIA Hacker Night 2008 mascot. Guy Kawasaki’s new venture Alltop collects popular Blogs and categorizes them. It makes it very easy to stay up to date on a wide area of topics like Social Media, Marketing, Enterprise IT, Food and Wine (some of my favorites). Yesterday Alltop launched the category Rich Internet Applications. It includes great resources on RIA and specifically Flex and AIR development, like the blogs from Ryan Stewart, Mike Chambers and Peter Ent. Check it out! P.S. : Yes, this humble little Blog is included as well. Just found this good article on ReadWriteWeb about Flex and AIR usage for enterprise applications. Specifically interesting since I have been pushing this topic for the last 3 years with a special focus on the SAP ecosystem. Today there are many companies using Flex and/or AIR to make enterprise apps user friendly and engaging (Philips, Fender, SAP and many more) and that number is rising fast. With SAP’s announcement to enable embedding of Flex applications in their WebDynpro UI framework we will see a further surge of Flex adoption in the enterprise. To learn more visit SAP TechEd this year. I will be there. I haven’t blogged a lot about Adobe products recently, and yes I work for Adobe so I am biased. For the last weeks I have used internal releases of the just announced Acrobat 9 and Acrobat.com and I am very impressed. I don’t work in the Acrobat team, but during the last year I did a lot of research on collaboration in the enterprise and started a seed project in Adobe Corporate Development to envision and build a solution which will allow people to mashup custom workspaces on their desktop and collaborate with others in real time – all that without expensive IT investments but a simple subscription to a hosted service. With that perspective I found the new Acrobat release in combination with Acrobat.com a significant move for Adobe into the next generation enterprise collaboration space. So what impressed me the most? Acrobat.com delivers a suite of hosted services for document management and collaboration. What is truly amazing is that you get a real-time collaboration service including audio and video conferencing as well as screensharing for up to 3 participants for free. This service, called Connect Now can be accessed directly in the free Adobe Reader and in Acrobat. So while looking at a document you can kick off real time application sharing and then switch over into screen sharing if needed. Connect Now can really jump-start the momentum for web based real time collaboration in the enterprise. No more signing up and scheduling for a web conferencing session. Just use your Acrobat.com account, email your collaboration room URL to others and do it. No need to involve the IT department and since the client runs in the Flash Player no complex installs either! Additionally Acrobat.com features document file sharing, including the ability to review documents right in the browser or embed them into your blog (see below) or web site. There is even an AIR based client with a nifty “mini-mode” for easy uploading. Finally if you haven’t tried Buzzword, the flash based online word processor yet it is now integrated in Acrobat.com and features new capabilities like PDF generation. So what’s new in Acrobat 9 then? Yes, there are significant performance improvements customers have asked for and that’s very important, but there is much more. There are three features, which impressed me the most. The integrated real-time collaboration is really cool and useful. This allows you to work in real-time with others on reviewing a document. Once you start the real-time collaboration session flipping pages, zooming and other features are synchronized in real-time between users. This is not traditional screensharing but two separate instances of Acrobat working in synch. I believe this type of application collaboration will become more and more popular and is also an important feature for my current project. We are actually using Cocomo, which is the public developer API for Connect Now. Acrobat 9 also treats Flash content as a first class citizen. This means you can embed Flash movies and widgets right into your PDF document and they stay fully interactive (including Flex applications). Talking about movies in PDF, the Acrobat team has built a set of video annotation capabilities. Now you cannot only mark up the document but you can make annotations right in the video. While not so important for my daily work this is a true time saver for people collaborating on video content editing. One last feature you should check out in Acrobat 9 are portfolios. A small team started with the mission to make PDF’s engaging and fun to work with. Not a small feat since we are talking about boring documents. In collaboration with the Adobe Experience Design team they came up with a really cool way to package documents into an animated and dynamic portfolio. Best of it no programming skills required. Leveraging the power of Flex users can choose from different ways to present and browse the documents in a portfolio. It is hard to describe so I suggest you have a look at it yourself. Beyond all the single new features what really excites me is that this release rings in a new era of productivity applications for the enterprise, which combine an engaging user experience with the networking power of the Internet. Genesis, the code name for the project I am working on, is another major step into this direction. So keep you eyes open and you will learn more about Genesis here and in a new Blog I will start soon with the rest of the Genesis team. Today I played with the cool stop motion video feature of Premiere Elements. Result – A super cool video of Max scooting around the room. Check it out it is only 20 seconds. Big news from Adobe. This will make Flex the de-facto standard for Rich Internet Applications. Ryan Stewart was the first to blog it. The Alpha version of the Adobe client runtime code named Apollo is available for public download on http://labs.adobe.com. Could Apollo ring in the beginning of a new class of desktop applications programmed with web technologies? Adobe just released on Adobe Labs a web application called myFeedz. Based on your personal profile, your tags and your reading behavior it will present you news stories based on RSS feeds and web sites which are relevant for you. It has a very slick AJAX UI. Looks like the Netflix movie suggestion feature for RSS feeds and web site. Its for free so try it now. Today Michael Arrington covers Apollo, the Adobe runtime which supports web applications on the desktop, on both TechCrunch and in an interview with Kevin Lynch on TalkCrunch. The coverage spawned a number of reactions on the web and a top position on Techmeme. While Apollo is not released yet the interest is positive and people like Alex Barnett, Ryan Stewart and Amy Bellinger predict that 2007 will be the year of Rich Internet Applications. While the initial focus of Apollo sample apps is very consumer oriented (e.g. E-Bay client or MP3 Player) I have been contemplating for the last year how Apollo could be used as a Rich Client for Enterprise Applications. I had a number of good discussions with various people from SAP as well as SAP customers. The key capabilities enterprise users are looking for are usability, performance, offline abilities and desktop application integration. I presented my thoughts for the first time in May at the Americas SAP User Group Conference in Orlando. Back in May the interest was fairly limited but some early adopters realized the potential impact Apollo could have on the way we interact with enterprise applications. Since then the interest has significantly increased, especially since Shai Agassi discussed SAP’s project Muse at SAPPHIRE. I predict that significant adoption of Rich Clients in the enterprise will follow about two years after the adoption for consumer apps. IT departments tend to be conservative and there are still a number of difficult issues to solve, incl. the security of offline content and local system access. Also the synchronization between online and offline usage is a challenging topic and it will be critical to figure out which information is stored for offline usage for a particular user. Mike Chambers has a link to a 10 minute video interview / discussion with Christian Cantrell of the Apollo team on his Blog. For ongoing news about RIAs and Adobe Apollo see RIApedia, the new Blog from Mike potter (Developer Relations at Adobe) and check out this cool yourminis app.